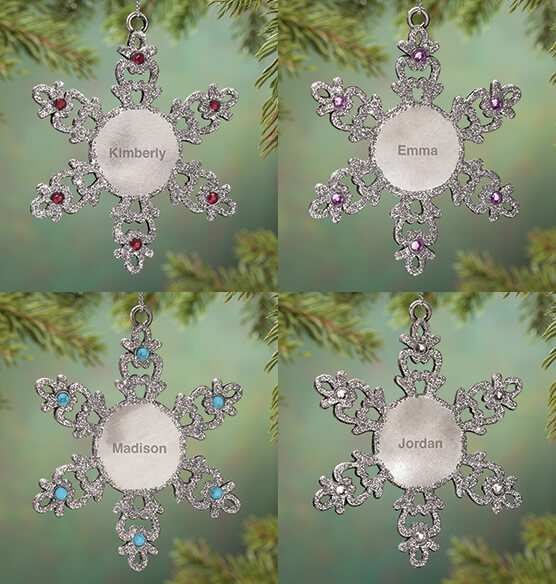 This personalized birthstone snowflake pewter ornament shimmers with your choice of all 12 birthstones—arriving custom engraved with any name. 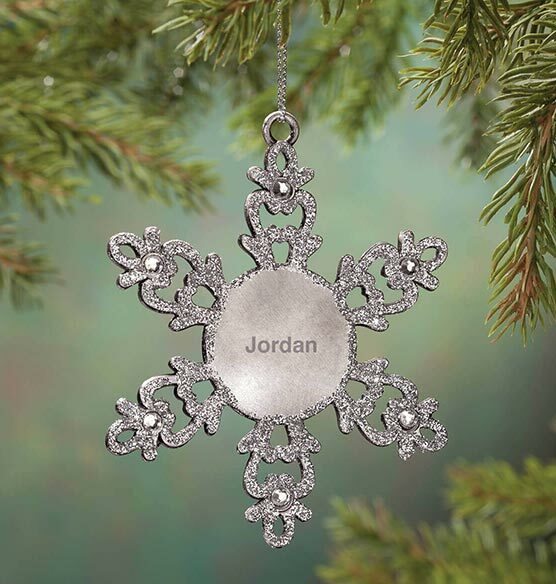 The solid pewter snowflake ornament features 6 faceted birthstones that shine through from either side, while bright silver glitter sparkles in front. 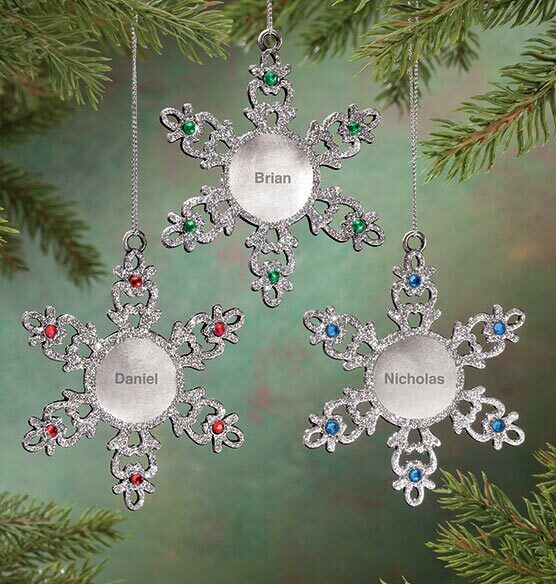 We'll personalize at no extra charge, making your thoughtful gift wonderfully affordable! Specify month. Specify name; limit 1 line, 10 letters/spaces. Christmas ornament measures 3 5/8" dia. ; includes silver cord for hanging. Hang it on Christmas tree. Were very nice except that some stones had to be reglued. The gems fall out easily and many were out in shipping. The gems were also smaller than I expected. The spelling was fallowed correctly because many of the names have odd spellings. No 2 snowflakes are the same. My sister has 3 daughters and they’re all completely different. 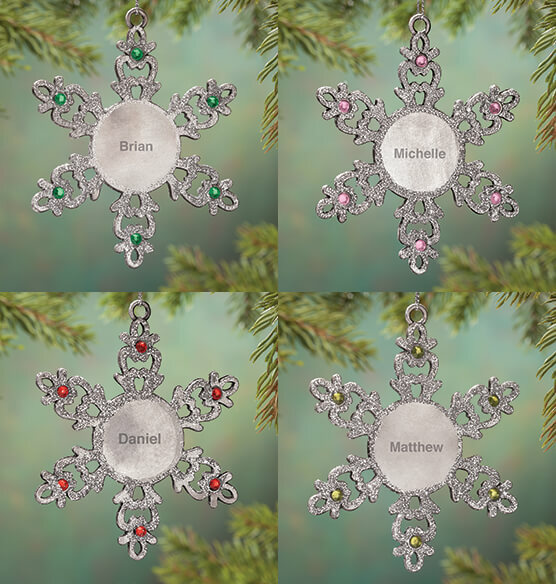 My kids have names I can't find in stores, these were perfect and I could personalize them. I wanted them to match my other kids ornaments. My child had a different spelling of their name. Because it is what my daughter wanted. They made fast and easy to order. One for each of our children to hang on our tree. I love snowflakes, birthstones, and my grandsons! 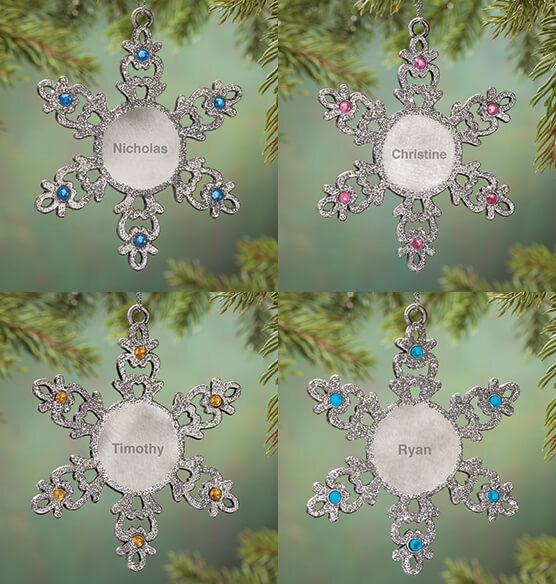 I choose these because I could get each family member name and birthstone to allow my grandkids to put their own name ornament on the tree every year. will you be getting may ornaments back in stock?